Combat was a magazine of the French Resistance. 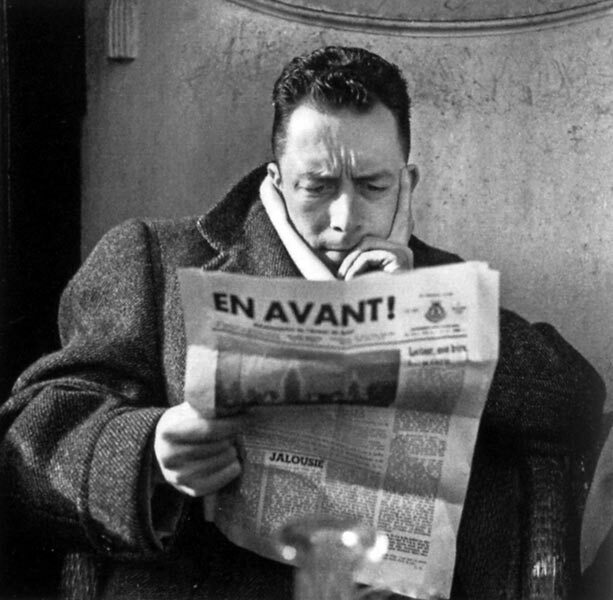 Albert Camus had been made editor in March 1944. (CJ287) In November 1944 the United States government invited eight French reporters to the U.S. to report on the war effort. (CJ308) Camus asked Sartre if he was interested in representing Combat. (CJ308) Sartre accepted. In addition to writing for Combat while in the U.S. Sartre also wrote for Le Figaro. (CJ311) His first article for Le Figaro was submitted on January 22nd and covered French supporters in the U.S. of Vichy Chief of State Philippe Pétain vs. those who backed Charles de Gaulle. (CJ311) While in the U.S. Sartre met Dolorès Vanetti, a French-speaking journalist of Italian and Ethiopian descent who presented the show féminim on the Voice of America during the war. Sartre returned to France at the end of May. (CJ317) He would return to the U.S. the following year (see 1946). c. 1945: Barnett Newman finishes "The Plasmic Image." 1945: Guggenheim Museum purchases 11 paintings and 1 gouache by Adolph Gottlieb. 1945: Mark Rothko is included in the Whitney Annual. 1945: Franz Kline and wife are evicted from 150 West Fourth Street. 1945: Philip Guston has his first solo exhibition. Sanctuary, 1944, (no. 2) was painted in Iowa City, and shows details of an Iowa City street in the background. The color, in deep reds and greens, has here become much richer; the figure is modelled in color and light and shadow in a manner suggestive of the Venetian Renaissance. 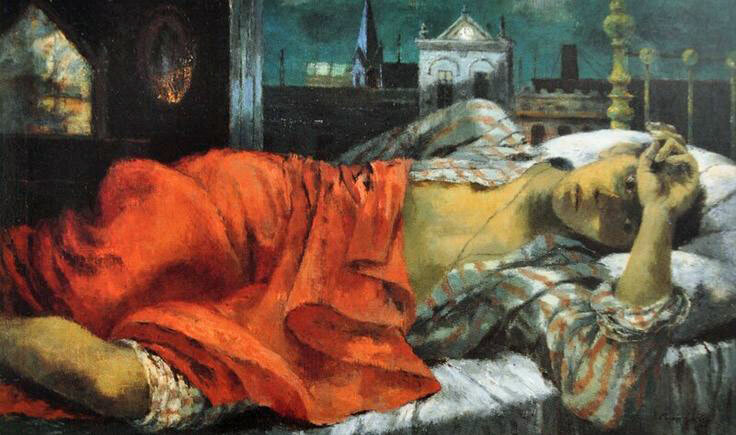 The reclining boy stares out at the spectator with an expression of haunting melancholy which carries the withdrawn expression of the figures in Martial Memory to the point of romantic nostalgia. This and other single figures of this time, accomplished as they are in traditional terms, seem to be almost a retrogression, a denial of the contemporary world which he had been exploring. However, they were necessary technical experiments to complete his control of the oil medium, and they were necessary personal experiments in his search for a subject matter. These lyrical, sensuously painted figures were immediately popular, and enhanced the growing reputation of the artist, although not in terms which necessarily pleased him. In 1945, he won first prize at the Carnegie International for a comparable single figure, entitled Sentimental Moment, 1944. As a result he was given a three page color spread in Life magazine (May 27, 1946), in which, however, he protested that he did not like the literal approach of his prize winning painting. 1945: Franz Kline paints The Synagogue. Although a rural environment, Connecticut was much more connected with Manhattan than Virginia. Other artists lived in the area, including Yves Tanguy (who was with the Pierre Matisse Gallery) and his wife Kay Sage who the Gorkys visited. Although Tanguy could speak little English, Gorky's wife Agnes translated for both and wrote to her friend Jeanne Reynal that Gorky and Tanguy were "very fond of each other." (MS291) The Gorkys also saw a lot of the Calders. Alexander Calder was called Sandy and Gorky's daughter Maro would confuse "Sandy" with "Santa" as in "Santa Claus." Calder later recalled that Gorky "seemed a bit unhappy." (MS292). January 9 - February 9, 1945: Mark Rothko's first solo exhibition at Peggy Guggenheim's Art of This Century Gallery. The show included Miro's The Constellations and ceramics. January 1945: Willem de Kooning wins a competition. The exhibition attempted to predict the direction that art might take in the next five years. Porter was a friend of Peggy Guggenheim and Howard Putzel which was reflected in his choice of artists, many of whom had exhibited at Guggenheim's gallery or the gallery that Putzel ran after splitting from Guggenheim. February 1945: American and British planes firebomb Dresden. March 1945: Adolph Gottlieb at Howard Putzel's 67 Gallery (East 57th Street). March 1945: American Abstract Artists' Annual exhibition at the Riverside Museum in New York. March 1945: Matta solo exhibition at Pierre Matisse. The exhibition included large canvases such as X Space and the Ego measuring 202.2 x 457.2 cm. Edward Alden Jewell reviewed the show for The New York Times. Those who may have come to feel in a degree at home with the abstractions Matta has exhibited here previously will now, visiting the Pierre Matisse, find themselves, so to speak, homeless... Gone, almost entirely, is the fugacious play of colored shapes that used once to bring to mind compositions designed by Thomas Wilfred for the Clavilux. We had even come to refer to one prevalent color as Matta magenta. The palette is now severely stepped down, and the erstwhile superimposition of calligraphic arabesque has been tightened into forms - still abstract, but much more definitely defined as such. These new forms are developed far enough to connote (if chiefly in the catalogue) humans and objects pertaining to the natural world. But do not expect too much of them in this connection - warning sufficiently illustrated by the "Apple Eater," which we reproduce. It is a strange and rather terrifying breed that Matt's brush has bred. All of these men and women resemble weird mechanized insects. Yet, oddly they live, and the sense of vibrant motion is startlingly conveyed. March 5 - 31, 1945: Jackson Pollock solo exhibition at The Arts Club of Chicago. Breton asked Gorky to illustrate a book of poems he was bringing out - Young Cherry Trees Secured Against Hares. March 13 - April 11, 1945: "European Artists in America" exhibition at the Whitney Museum of American Art. Herman More, the curator of the exhibition wrote the foreword for the catalogue, commenting "From colonial days it has been the genius of America to absorb foreign influences in art, and from these sources to develop distinctive national characteristics..." (EC) Jewell included More's comment in his review of the show which was published on March 18th in The New York Times five days after the original announcement about the show. March 19 - April 14, 1945: Jackson Pollock's second solo show at Art of This Century. Other critics weren't so favourable. Maude Riley wrote in the April 1, 1945 issue of Art Digest, "I really don't get what it's all about." Parker Tyler compared Pollock's work to "baked macaroni" in the May 1945 issue of View. The New Yorker and The New York Times failed to review the second show. March 21 - May 13, 1945: Piet Mondrian retrospective at The Museum of Modern Art. There has been a great to-do lately over Mondrian's genius. In his fanatic purism, his point of view is the matrix of the abstract esthetic. His concept, like that of his colleagues, is however founded on bad philosophy and on a faulty logic. Mondrian claims that should we reduced the world to its basic shape, we would see that it is made up of horizontal and vertical lines... Were this over-simplification true, what logical process is it that asserts that since the world is made up of vertical and horizontal lines, therefore a picture made up of such lines is the world or a true picture of it? March - April 1945: Franz Kline exhibits again at the National Academy Annual. Rothko was nineteen years older than his new (second) wife. Unlike Rothko who had grown up in modest surroundings as an immigrant outsider, Mell (b. January 3, 1922) was American-born (Cleveland, Ohio) to upper middle-class parents. Her father, Morton Beistle, owned Allied Products Corporation, a road construction company. She was the eldest of four children - a brother Robert (b. 1920), a sister Barbara (b. 1924) and another sister Shirley (b. 1928). Her mother Aldarilla [née Shipley] had creative aspirations. She wrote and adapted children's plays performed by the Players on Wheels and the Cleveland Public Playhouse. She also hosted a children's radio program on a local station. Mell, encouraged by her mother, took classes at the Cleveland Art Institute. When she won an elementary school art contest she won a copy of The Graphic Bible which Mark Rothko (then Marcus Rothkowitz) had illustrated. In high school she was a member of the Literary, Art and Motion Picture Appreciation clubs and helped to start Crest, the school's literary magazine, becoming its editor. When she was sixteen years old she collaborated with her mother on the first of five children's books - text by Aldarilla and illustrations by Mell. She started college at Skidmore in upstate New York in September 1939, majoring in fine and applied arts and worked for the art department matting and framing work for student shows. During her senior year she was engaged to a member of the Royal Canadian Air Force who was killed in the war during her senior year. Spring 1945: Mark Rothko exhibition at the Mortimer Brandt Gallery. Spring 1945: Robert Motherwell spends spring with William Baziotes in Florida. April 1, 1945: The Battle of Okinawa begins. April 1945: Barnett and Annalee Newman learn of the deportation of Annalee's relatives in France. April 1945: The Samuel Kootz gallery opens. 1945: Robert Motherwell signs a five year exclusive contract with the Samuel Kootz Gallery. ... at that particular moment, which must have been at the end of 1944 or early in 1945 he [Sam Kootz] decided that he wanted to start a gallery; and because he had no financial backing they would have to be young artists, they would have to be modern artists. I think his favorite artist in Europe was Léger. He liked strong, masculine, semi-abstract artists. The only inducement he could have would be to pay the artists. so he offered us two hundred bucks a month for our complete works which had to be a minimum of seventy-five works a year - drawings, watercolors, paintings, etcetera. It also was the end of the WPA. It was the one chance to be supported entirely by one's own work, difficult as the terms were. I insisted I wouldn't go unless he took Baziotes, too, who was desperate. Kootz was reluctant to but finally did. He also took Gottlieb, Hofmann, David Hare, Carl Holty, somebody else, I forget who. And he started the gallery. Peggy as a corollary had always made it very clear that she really wanted to live in Europe and that the day that war was over she was going to move the whole damn thing back to Europe. She had originally meant to have her gallery in London, and she didn't know whether she was going to take it back to London or where. As it turned out, she took it back to Venice. She always very clearly said to us, "I will help you as long as I'm here in whatever way I can, but the day I go you're on your own." I think it was only Pollock that she made some kind of arrangement to take care of. The rest of us were really on our own. Nearly everybody who had showed with her went either to Kootz or to Betty Parsons. April 13, 1945: Combat magazine reports on Buchenwald. May 14 - July 7, 1945: "A Problem for Critics" exhibition at Howard Putzel's 67 Gallery. He would also teach there during the 1951 summer season. ...I mean in those days I couldn't afford to go anywhere for the summer. They paid a hundred dollars a month to distinguished visitors and they themselves had an income of twenty-five dollars a month. But it was in the mountains and it was sunny and there were marvelous guys there. And it was a way of getting a break from New York and at the same time going to a place that one would not feel alienated from. Black Mountain more than any place was the avant garde college that Americans had. Reed College in Oregon wasn't then. Bennington wasn't then. But Black Mountain really was. And since my whole commitment was to the avant garde, nothing could have been more natural than to go there, given all the circumstances... Among my students were Rauschenberg, Cy Twombly, Francine Gray, and others. It was a very small community and apart from my classes the thing I remember with the greatest pleasure and realist contact was through the baseball games we played on Sundays. I remember - what's his name who had the press in North Carolina - a poet... Jonathan Williams. He was a superb centerfielder. I remember Joel Oppenheim pitching. I remember Charles Olson playing first base with a tremendous beat. I remember Dan Reis, a marvelous catcher. I remember Fielding Dawson egging us all on with Southern whoops, and so on. And it's odd, there in a funny way at the baseball games all the various areas, camps, blue jeans, Brooks Brothers, whatever it was, it all suddenly was flattened out and we were all just playing a marvelous game together and having a ball. We did that every Saturday and Sunday. Summer 1945: Wolfgang Paalen stays with Robert Motherwell.